The Bubblegum locker cupboard is a colourful and fun storage unit designed for use in schools, pre-schools and nurseries. 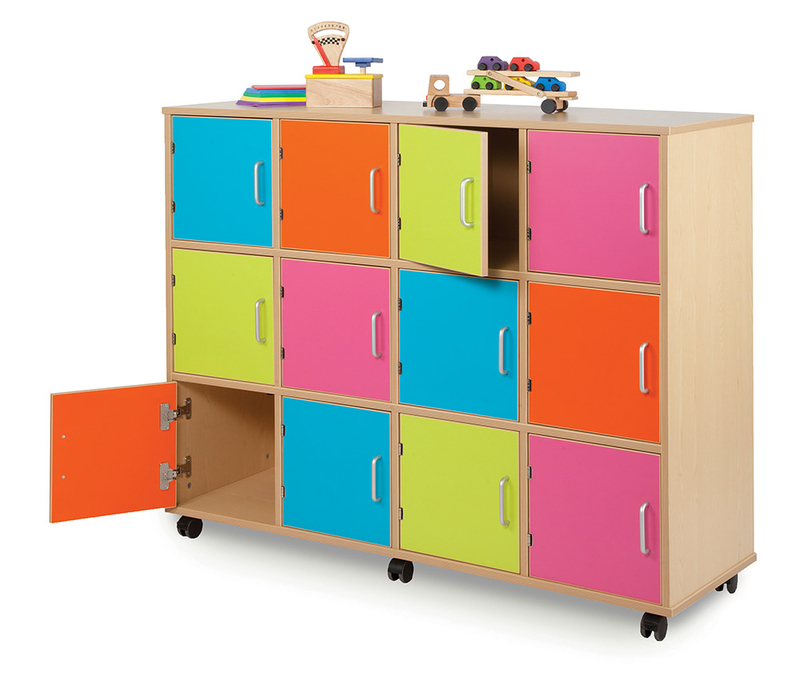 The colourful locker storage unit features 12 individual cupboards with colourful doors. Perfect for storing school bags, lunchboxes, shoes or P.E. kits in classrooms, cloakrooms and school changing rooms. The Bubblegum locker unit is supplied in a mixture of 4 eye catching colours – cyan, tangerine, lime and pink - as shown in image. Constructed from 18mm durable MFC in a modern Japanese Ash finish, complete with easy glide castor wheels for easy mobility when required. Please note: the toys featured in the product image are not included. For more information please Contact Us or call us on 01733 511121. View our full range of Shelving & Cupboards and Cloakroom Storage.